Happy Earth Day! I am a humongous fan of the earth and although I think it ought to be celebrated every day, I’m glad it has its own special day around which the world can rally and collectively express love for this blue planet we call our home. 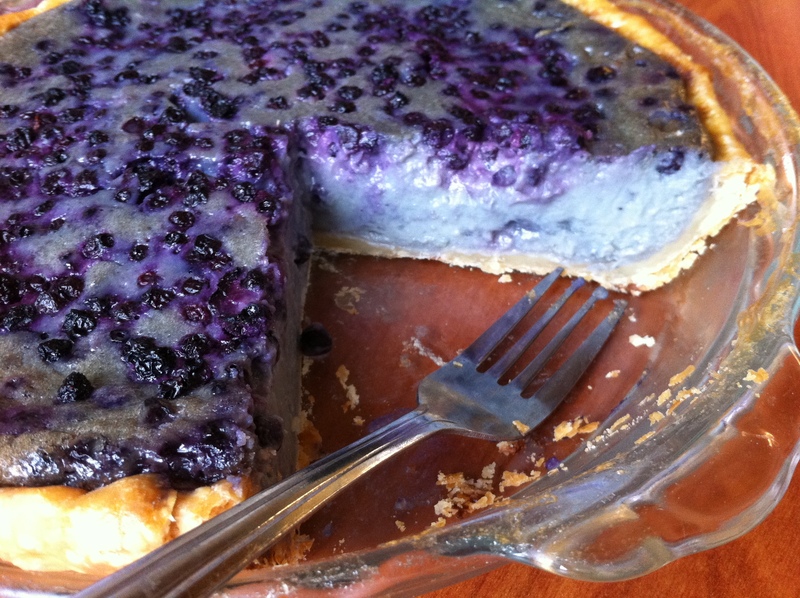 In a happy coincidence, this week’s Friday Pie Day features a dish with a hue much resembling that of our fair planet. Blueberries and lavender join together in a flavorful arrangement that is just unique enough to be memorable yet normal enough to be addictive. In fact, this pie is so great I would hereby like to dedicate it to Mother Earth. While pie-baking may not automatically seem like an intuitive method of celebrating ecological diversity, I would argue that it has the potential to do just that. When we buy locally-grown, healthful foods – or better yet grow the food ourselves – and appreciate the beauty in a “farm to table” approach whereby we get our hands dirty and our souls satisfied in the process of filling our bellies with wholesome goodies, then we are engaging in the most ancient rites of expressing thanks for the nourishment this earth provides. And since a pie cannot be eaten entirely by one person (or shouldn’t be, in any case), the necessary fact of sharing in this bounty is another form of showing reverence for our Earth and the comforts and health it brings to us in the simplest of forms. Earth Day is about thinking BIG and thinking critically about how we can change the way we go about our lives in order to create a more sustainable place for all us humans who depend on the Earth’s well-being to survive. At the same time, it’s also about thinking in smaller, more bite-size terms (heh, pun intended). Start with the way we think about, grow, purchase, share, dispose of, and waste our food. How can we be a little (or a lot) more responsible, thoughtful, intentional? And why does it matter that we are? To me that’s what Earth Day is ultimately about: re-thinking our relationship with the soil and the sky who keep us alive. If the Earth provides such wonderful things as the ingredients to go in a delicious pie, doesn’t it merely make sense to do everything in our power to make sure it always will? Make pie crust, roll out and bake in a deep-dish pie pan at 375°F for 30 minutes (you will probably want to weight it down with pie weights, rice, or uncooked bean on parchment paper). Take out shell and turn heat down to 325°F. Warm the cream and milk in a small saucepan over medium heat until it just comes to a simmer. Add the lavender, stir, then take off the heat and steep for 30 minutes. Have a colander or mesh strainer ready over a bowl. Heat a large skillet over medium high heat. Add the butter and when it foams, add the blueberries. Cook just until they are soft and much of the juice has run out. After about 3-5 minutes, take off the heat and pour into the colander. Set aside the drained berries. 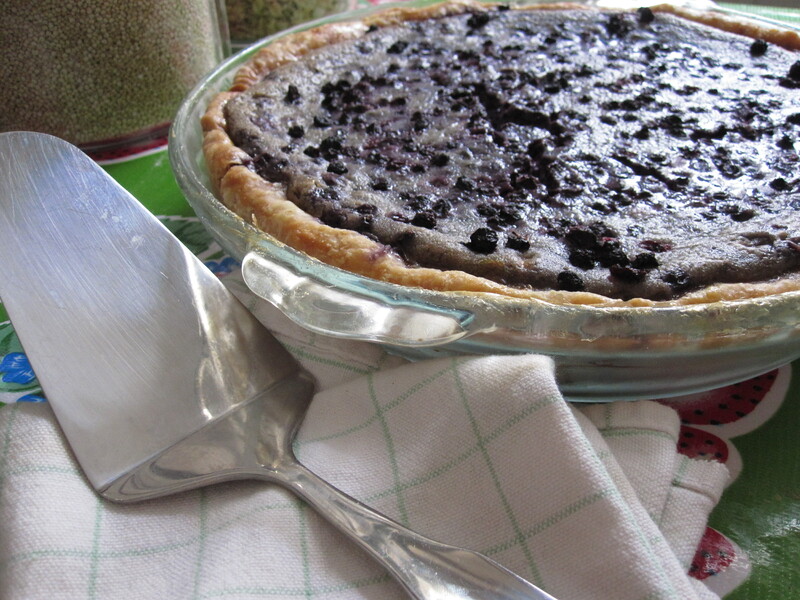 Mix the blueberry juice with two tablespoons cornstarch and set aside. Whisk the eggs and egg yolks with the vanilla, sugar and salt and set aside. Reserve the leftover three egg whites and beat with a fork lightly. Set aside. Strain the cream and discard lavender. Whisk in cornstarch/blueberry juice mixture and bring to a simmer over medium heat, whisking constantly. When the mixture boils and thickens slightly, remove from heat. Whisk a little of the cream into the egg and sugar mixture to temper, then add it all and whisk vigorously. It will look curdled and broken at first but will come together into a smooth, thick, glossy and violet mixture. Stir in half of the drained and reserved blueberries. Pull out the top oven rack and set the pie shell on it. Pour mixture into the parbaked pie shell and bake for 30 minutes. After 30 minutes sprinkle the rest of the blueberries on top. Brush the crust with the slightly beaten, reserved egg whites, and put back in. Bake for another 15 minutes or until the center is wobbly but firm and the crust is golden and shiny. Take out and let rest for at least 15 minutes before serving. Serve with whipped cream or ice cream. 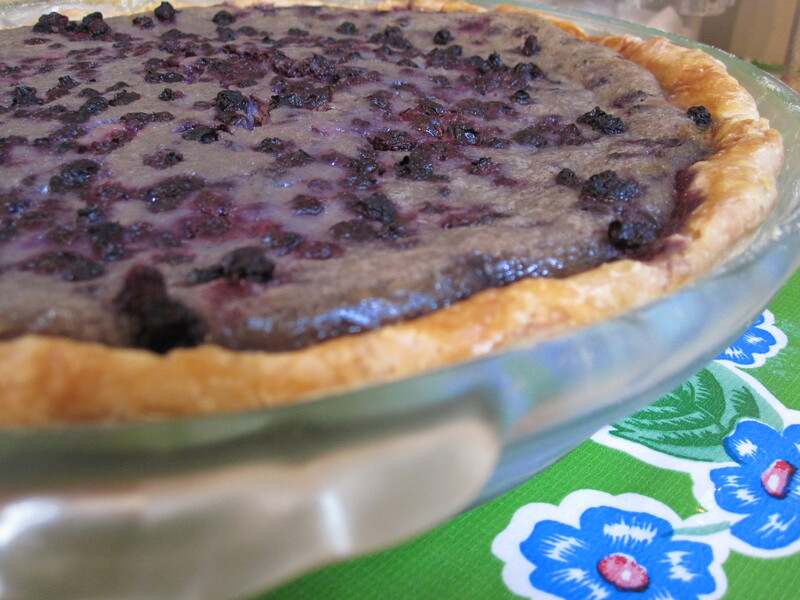 This entry was posted in Pie and tagged blueberry, friday pie day, lavender, pie. Bookmark the permalink.